Forever Manchester President and MD of Brother UK, Phil Jones writes a monthly column for our newsletter. 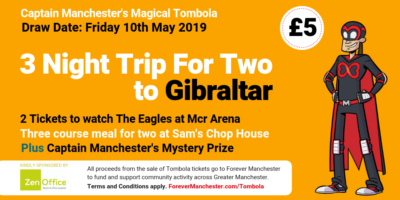 Forever Manchester is a very unique charity in that it assists multiple causes in multiple locations across Greater Manchester. Unlike many single issue charities, we fund a huge array of projects and people across a wide assortment of causes, we are multi-dimensional in our approach. This can offer great appeal to a business selecting a charity partner to fundraise for, as different people are touched by different things. Physical health, mental health, young people, older people, the neighbourhood in which they live and more. We touch and fund a wide spectrum of causes, which means that the ‘fit’ for a business is much wider than most charities. If you back Forever Manchester, you’ll be in unique position of contributing to an organisation that invests in the potential of people to do great things for others. We provide the spark to the embers of ideas of real people who think they can do something about real problems in their communities and make a real difference. Not London, not Birmingham, not outside of the UK, but here on your doorstep. The places where your workforce will likely live or where you might next be recruiting from. Business needs to take the lead on place based giving. It’s the next big thing. You invest in communities, those communities thrive, the people who come from communities thrive in your organisations and you thrive as a business. It’s as simple as that. Want to know more? Speak to one of our team on 0161 214 0940 about how your business can get involved and make a real difference to those around you.